Hi Everyone, and welcome to my stop on the Before She Ignites Book Nerd Addict Blog Tour. 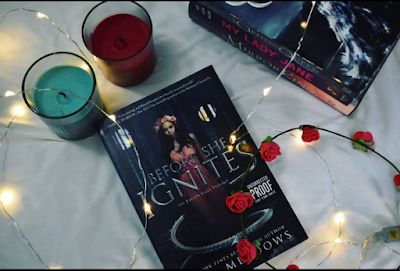 When I heard from the QUEEN, Jodi Meadows, herself that I would be one of the lucky souls to get my hands on an ARC of the first book of her BEAUTIFUL new series, I freaked out for at least two days in pure excitement. Synopsis: BeforeMira Minkoba is the Hopebearer. Since the day she was born, she’s been told she’s special. Important. Perfect. She’s known across the Fallen Isles not just for her beauty, but for the Mira Treaty named after her, a peace agreement which united the seven islands against their enemies on the mainland. But Mira has never felt as perfect as everyone says. She counts compulsively. She struggles with crippling anxiety. And she’s far too interested in dragons for a girl of her station.AfterThen Mira discovers an explosive secret that challenges everything she and the Treaty stand for. Betrayed by the very people she spent her life serving, Mira is sentenced to the Pit–the deadliest prison in the Fallen Isles. There, a cruel guard would do anything to discover the secret she would die to protect. No longer beholden to those who betrayed her, Mira must learn to survive on her own and unearth the dark truths about the Fallen Isles–and herself–before her very world begins to collapse. 1. Creating the world a fantasy novel is set in is just as important as the characters in it. Could you give your readers a brief history of the Fallen Isles and their Fallen Gods? Jodi: That is a big question! I have lots and lots of history for the Fallen Isles and the world of Noore, most which won’t make it onto the story. The quick version is that there was a planet called Noore, and gods that lived in the heavens. One day, for unknown reasons, seven of those gods crashed down into the ocean. (Lots of people died.) Those gods are called the Fallen Gods, while those who remained in the heavens are the Upper Gods. 2. There are various dragon species in Before She Ignites. Could you give us their species names and a small description about each of them? Jodi: There are way too many species of dragons to list here! We’d never move on to the next question, haha! But the main species of dragon that’s in the book is the Drakontos raptus, a small hunting dragon. While they aren’t domesticated, they can be taught, like a ferret or a bird of prey. 3. If you were a Drakon Warrior, which of the above species would you choose to ride and what would you name your dragon? Jodi: Frankly, I’d be a terrible Drakon Warrior. I am an inside person. But if I had to be one and I somehow survived the training, I would like to ride a Drakontos rex. They’re very large dragons, and I feel like if I were to slip, there’d be a lot of dragon for me to catch myself on before I fell to my death. I might name it Sandblaster. Not for any specific reason. It’s just the first thing that came to my mind. 4. 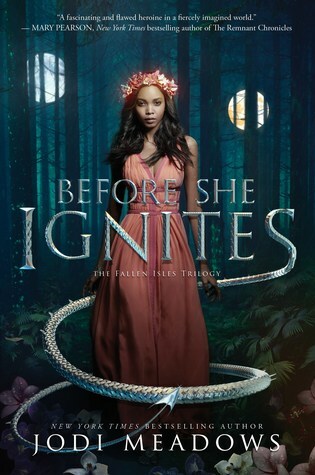 Noorestones play a very important role in Before She Ignites. For readers who haven't read the book yet, do share one fact about noorestones that you know will intrigue them! Jodi: Noorestones are crystals mined from inside the earth. When sunlight touches them, an inner fire is activated and they begin to glow. Since they’re plentiful, they’re an inexpensive (and pretty) source of light for everyone in the Fallen Isles. 5. Mira Minkoba is an atypical YA heroine as she struggles with her self worth and panic attacks. If you could give one piece of advice to Mira what would it be? Jodi: I would ask her to believe in herself. That’s hard for all of us, I know. But I would remind Mira that she is strong--stronger than she knows--and she can endure. 6. Everyone talks about the challenges a debut author faces as their first book or series goes out into the world. The Fallen Isles trilogy will be your third series coming out into the world. What changes as each new book comes out and what parts remain the same? Jodi: When my first book came out, I sort of felt like the world would shift on release day. That my life would be forever altered. And in a way, it has, because people can buy my books now. But overall, the day felt rather anticlimactic. Now, I know what to expect, which is a relief, but I think there’s always a fear of losing people. Writers always hope to grow their audience, and the last thing they want is to disappoint existing readers. 7. What can you tell us about books two and three in the Fallen Isles trilogy? Might there be some badass dragon riding in on of them? Jodi: I think reader will kill me if there isn’t badass dragon riding, and I want to live to write more books. Thank you, Sarah, from the book blog The YA Book Traveler for designing the beautiful images and for creating the amazing book trailer which we can't stop watching! We can't appreciate you enough.